The goal of paramedics is to keep patients alive and quickly get them to a hospital, where there are resources to save lives. But what if the trauma center could come to you? “The patient’s hospital visit truly begins when the paramedics arrive on the scene,” said Craig Evans, the executive director of the Northern Virginia EMS Council. Inside Inova Fairfax Hospital, News4 got a glimpse at how efficiently the program works. It starts with a call from the medic to the hospital’s blood bank. In a matter of minutes, the team at the hospital packs blood for the patient, adding ice to keep it cold. An emergency courier then gets the blood to a deputy’s cruiser, an ambulance or even a Fairfax County police chopper. “We didn’t model it after anyone. We came up with this on our own based on a call,” Evans said. That call was on Sept. 8, 2017 on Evergreen Mills Road. Emergency crews surrounded a mangled mess and desperately tried to free a family of five trapped after a school bus that was converted into a food truck crushed their car. Every second that went by, the victims lost blood. Loudoun County Fire and Rescue’s Dr. John Morgan realized rescuers needed more time so he called Inova Loudoun Hospital and asked for more blood. “I was actually expecting that when I called the hospital it might be a ‘no’ answer because there’s a lot of regulation involved with blood and having the hospital trust us enough to send that blood away from the hospital to the scene,” Morgan said. But the hospital mobilized and sent the blood by ambulance. They began transfusions on site. Four of the five people inside the car survived. “The outcome could’ve been much worse,” Morgan said. They didn’t realize it in the moment, but it was the first real-world test of what is now the FACT*R protocol. And it proved successful. 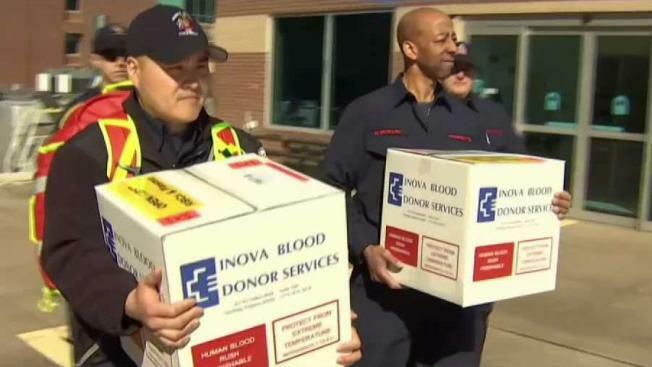 “But the only way we can do that is if we have an adequate inventory at all times,” Terri Craddock, with Inova Blood Services, said. Inova and the local EMS crews say other jurisdictions have asked how they can start FACT*R in other parts of the country. They are willing to share their model in hopes of changing trauma center care. “We hope that it’s reproduced across the country so that we can save lives everywhere,” said Dr. Dan Avstreih with Fairfax County Fire and Rescue.